In December 2006, Colorado was buried by two consecutive blizzards, which came to be known as the “Holiday Blizzards of 2006.” I was unaware of the coming historic snowstorms, even as I motored my way up and over Raton Pass behind the wheel of my canary yellow, 1982 Toyota Corolla-Tercel two-door sedan. As the snow began to fall, visibility dropped and all other traffic abandoned the roads. I pressed on through the storm, carried safely along in one of Toyota’s most daring designs. Many have forgotten that the Toyota Tercel was not only Toyota’s very first production front-wheel drive car, but also one of its most important and interesting. By the time the Corolla-Tercel appeared on the U.S. market in 1980, this country had already been exposed to front-wheel drive cars like the Honda Civic, Renault Le Car and Volkswagen’s Rabbits and Dashers. Many of these cars were already second generation front-drivers, with the first wave of Fiat 128s, Renault 16s, Subaru Stars and Saab V4s already fading fast from memory. (There were even earlier front-drivers, but they had faded even more quickly, mostly memorable only for their mechanical freakishness.) Even Toyota’s arch-nemesis Nissan had launched its Datsun F-10 into the U.S. marketplace by the late 1970s. Ultra-conservative Toyota was seemingly late to this front-wheel drive party, but it had its reasons. Front-wheel drive cars of the 1970s possessed some very interesting handling qualities. If you’re old enough, you may remember stomping on the gas in a first-generation civic and having the car pull (against your will) into the next lane. Torque steer. Even the relatively civilized Le Car might exhibit alarming wheel hop when accelerating on loose or slippery surfaces. Exciting stuff, but not really what the driving public was looking for, and especially not what staid Toyota buyers were looking for. Toyota, as it turns out, was not late, it just wasn’t going to jump in before it could produce a front-driver that was as civilized as their bland rear-wheel-drive Corolla. In fact, Toyota had been keeping an eye on front-wheel drive developments since the 1950s, when the company took apart some Citroëns intent on learning the secrets of front wheel drive and using them in its upcoming Publica minicar. It was not to be, though. Issues with the jointed axles and handling meant the Publica was launched as a rear-driver, even if it sported a very Citroën-esque air-cooled, flat-twin engine. Had the Publica been launched with front-wheel drive in 1961, Toyota would have been a pioneer for the layout in Japan. Instead, Suzuki, Subaru, and Honda jumped in while Toyota watched and plotted. By 1978, when the Tercel appeared in Japan as the Corsa, front-drive cars had more or less fallen into a common pattern: The engine was mounted transversely, the transmission sat beside it and unequal-length drive shafts carried power out to the wheels. Toyota, though, would not do it this way. When the Corolla-Tercel finally appeared on these shores in late 1979 as a 1980 model, Toyota seemed to be doing its damndest to fool buyers into believing it was just another rear-driven Corolla. They even called it a Corolla-Tercel, as if it was just another version of the standard model. When you opened the hood of a new Corolla-Tercel you saw a longitudinally mounted engine, front-to-back like in any standard rear-drive car. When you shifted gears it felt the same as shifting any other contemporary Toyota. No rubbery Honda-esque vagueness in that linkage. The new front-driver was proving it was Corolla enough for Toyota’s customers. This set up helped reduce front overhang, since the final drive was under the engine, instead of behind it. Further overhang reduction was accomplished by reducing the overall length of the engine by adopting conjoined cylinder walls. The result of all this was a very compact power unit despite its longitudinal orientation. Beyond saving space, the bonus of keeping front overhang to a minimum was it theoretically got rid of a lot of the understeer typical of other front-drivers. So too did doing away with wildly mismatched driveshaft lengths. Torque-steer and other typical transverse front-drive demons were undetectable. Toyota kept the suspension fairly conventional, with MacPherson struts in front and independent coil springs at the rear. Both ends were helped by anti-sway bars, which also gave the car just a hint of lift-off oversteer, at least just enough to be amusing when pushed hard. Although behaving and looking like its RWD brethren, the Tercel possessed the FWD advantages of more interior room and trunk space. Clever car. 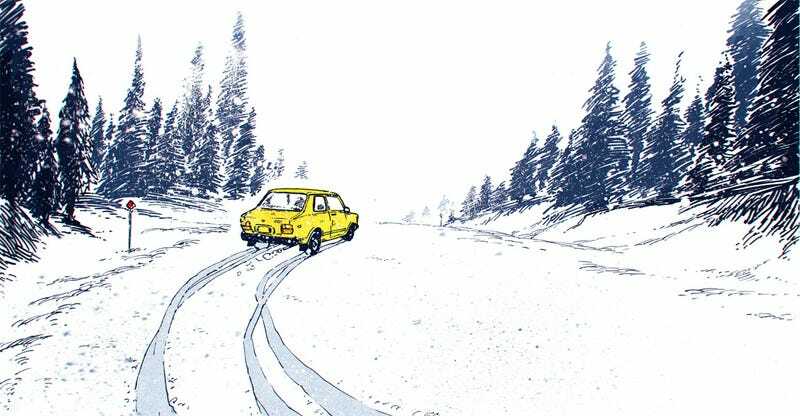 Additionally, the little Tercel was blessed with one more front-wheel drive advantage: excellent traction in snow, thanks to the the weight of the drivetrain resting over the driven wheels. It was something I learned firsthand when I got caught driving my 1982 sedan over Raton Pass in those Holiday Blizzards of 2006. Snow fell thick and fast. Soon all other traffic had pulled over, leaving me, alone in the Tercel on the highway. A dead heater blower meant I had to keep driving or risk freezing if I pulled over to wait for the plows to show up. Once the road’s surface was covered, navigating the lanes became hazardous and challenging, but not impossible. Roadside reflectors warned me when I was aimed for driving off the pavement. I spent at least 20 minutes zig-zagging across the lanes, at about 20 to 25 mph, changing course every time I saw another reflector appear in front the the hood. Despite the need for frequent sudden changes of direction, the car handled competently, sure-footedly (sure-tiredly?) even on its narrow all-season tires. The previous (and original) owner had told me the Tercel was his “ski car” when he went into the mountains, because it handled the snow and ice better than his Ford Bronco. I believe him; aside from my experience in the blizzard, the Tercel had a ski rack, his Bronco didn’t. After some time of navigating the highway lanes by dead reckoning, I saw a plow coming up behind. I pulled over to where I thought the shoulder might be, then followed them down the mountain. I made it in the Tercel, pulling up to the house, tired as hell, at around three in the morning. The next day, I awoke to the little Toyota almost up to its door handles in wet, heavy snow. Damned good thing I didn’t stop or get stuck on the pass. After plows cleared the roads in town, I used the Tercel to pull out several cars which had gotten high-centered when attempting left turns over unplowed sections of road. It never failed to pull through for me (or for others for that matter). The Tercel allowed Toyota to advertise popular front-wheel drive, without the risk of spooking off the typical Toyota customer, who might run for the hills if the steering wheel tugged at their hands in a funny way, or if they looked into an engine bay and saw, heaven forbid, an engine mounted the wrong way around. Unlike most of its rivals, the Tercel sacrificed nothing to front-wheel drive, but still raked in all the benefits of the layout. In its effort to make the most conventionally RWD-like front-wheel drive car, Toyota ended up with what was indeed a pretty unique little vehicle. The author scanned a number of old car magazines and ads for this article including the November 1979 issue of Car and Driver, the January 1980 issue of Car and Driver and the January 1980 issue of Road & Track. There are a number of excellent online resources as well, including Gazoo’s history of the first-generation Toyota Tercel and of the first and second generation Toyota Publica, archived here, here and here. These are cited in the excellent Japanese wikipedia entries for the Tercel and Publica here and here. Additional reading on the Tercel can be found in this good Curbside Classic article and this wonderful history on Driven To Write.